A well-written mix of real-time strategy and roleplaying games. SpellForce 3 competently blends RPG and RTS games into a generally enjoyable package, but there’s not enough creative force to create a lasting spell. What is it? A well-written blend of Baldur's Gate-style RPGs and real-time strategy games. SpellForce 3 presents a mishmash of small-party roleplaying games in the vein of Baldur's Gate and real-time strategy games in the style of Age of Empires, which initially made me wonder: If I can have an army at my back at any time, why wouldn't I use it? There's a band of trolls? By all means, send in the infantry. The fate of the world depends on defeating an evil wizard? Screw the personal heroics, send in the reserves. Happily, the concept usually works because the well-written story gives believable reasons for it to play a bit like Pillars of Eternity sometimes but an RTS other times. It's a tale of a constant and drastically changing fortunes, casting you as a reluctant outsider who can't escape the sins of his or her father or the prejudices of a world that treats magic with the same contempt we find in Dragon Age or Skyrim. It's a bit like Russell Crowe's Gladiator: sometimes you've got the world's best legions at your back, while at other times those legions are at your back because you're running from them, disgraced and falsely accused, in this case through a smelly sewer with a single other companion. These metronomic shifts between the big picture of a wider war and small moments within it are rare in RPGs. It's a good story, too, if derivative to the point that finding Dragon Age and Witcher parallels starts feeling like finding Easter eggs. Its companion characters are merely likeable rather than memorable. The familiarity blunts some of tale's emotional impact, but SpellForce 3 usually manages to make up for that with its richly detailed settings, some of which were made solely for brief sidequests. These metronomic shifts between the big picture of a wider war and small moments within it are rare in RPGs, no doubt in large part because of the problems they present for intuitive play. Most skirt the issue by barely involving the protagonists in the larger conflict at all, letting the battles unfold in flashy cutscenes or even in text descriptions in loading screens. SpellForce, though, has been doing this kind of thing since 2003, and never before has the mix worked so well. Simplicity is the key, as seen in the way it bundles all abilities for your four-person party into a simple action wheel that pops up when you hold Alt over an enemy. The RTS sequences require base building and gathering resources, but they're spread fairly far apart and the laborers and caravans usually do their work without outside management. 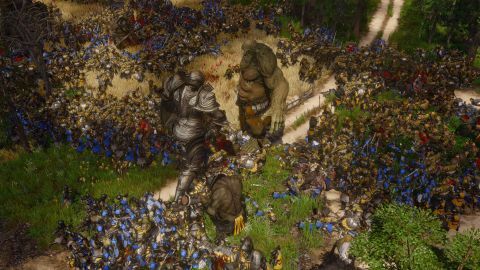 By keeping the RPG and RTS systems uncomplicated, SpellForce 3 ensures that they can both live on the battlefield at once without ever becoming too much to handle. Played in co-op mode with up to three players, SpellForce 3 can even feel a bit like a traditional RPG, although unfortunately, only the host gets a persistent save. Inevitably, some strategic depth gets lost in this simplification. SpellForce 3's adventures involve humans, elves, orcs, and dwarves, but you'll find no specialized racial buildings and each army plays largely like the other aside from minor differences, such as how the elves have a predictable fondness for bows. For the most part, attempting to position my four heroes properly in the absence of a real-time-with-pause system proved the greater challenge; I could generally win the RTS portions by tossing the blob of paper-weak soldiers I'd recruited at the enemy blob, triggering key spells from my heroes as needed. In the hybrid context of SpellForce 3, it's not really a bad design as it keeps the RTS portions brisk, as does the need to run out and capture new outposts in order to build the army's population and amass enough resources to keep the war engine going. These strategy sequences make for fun diversions, in other words, but they're wisely never the stars of the show. A decent (if laggy) multiplayer skirmish mode exists for anyone who wants more of it, but it mainly shows how weak the RTS elements are when stripped of their RPG backdrop. SpellForce 3 is an RPG above all else. For all its idiosyncrasies, SpellForce 3 is an RPG above all else. It's a smart move, as the RTS portions grant a sense of the stakes involved, while the RPG section keeps the story personal and full of emotional impact. The RPG part, in fact, contains SpellForce's more rewarding (if predictable) systems, whether it's the multiple talent trees that help you steer your companions into the roles you want them to play or the loot system that drops gear that's more interesting than what you'd expect from a hybrid RTS. Early on, when I found a helmet that spawns a goblin to fight for me, I was reluctant to give it up for objectively better digs.